by Keith and Heather Nicol. We recently spent a couple of days on Denman Island sea kayaking and generally exploring the island. 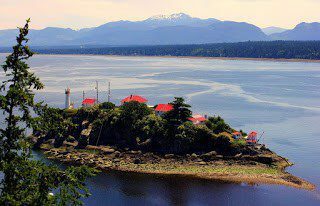 Denman Island is located just south of the Courtenay – Comox area and is just a short 10 minute ferry ride across Baynes Sound. We boarded the ferry at Buckley Bay in the morning on June 10. Once on Denman Island, we started by chatting with Mario Tancon who runs Denman Hornby Canoes and Kayaks. “Well , you’ve come at some of the biggest tides of the year. Unfortunately low tide is right in the middle of the day so you will have to paddle early in the morning or late in the afternoon if you don’t want to carry your kayaks a long way to the water,” Mario told us while we chatted on his front deck. 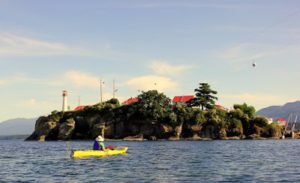 He tends to launch at a few places along the eastern side of the island since his main destinations are Chrome Island Lighthouse and the western side of Hornby Island. “With these kinds of tides your overall best bet is to launch at Bill Mee Park where there is a steep paved ramp to the water. And while you are in the area be sure to hike out to the end of Boyle Point Park where you can view the lighthouse and check out the eagle’s nest. So with this advice in mind we headed out to find the lighthouse trail and eagle’s nest. The trail is found at the end of East Road and is wide and well maintained. The trail is about 1 km long with a short side trail overlooking Eagle Rock. The trail offers excellent views of the Chrome Island Lighthouse and just to the right is a view of the eagle’s nest in a tree below the cliff. There were 2 chicks in the nest and mom was resting a few branches above them when we arrived. 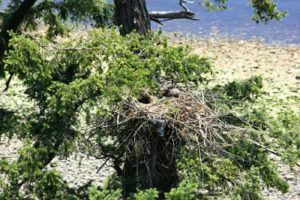 Apparently this nest has been used for a few years so is worth checking out on your next visit to Denman Island. Be sure to bring binoculars to get a better view of what is happening. Chrome Island Lighthouse which was established in 1891! We did a loop around the island and then paddled back along the same route. From Bill Mee Park the return distance to Chrome Island is 6 km so it makes a fine short trip which suited us since we hadn’t started paddling until 7:00pm. Heather approaching Chrome Island Lighthouse established in 1891! The next morning we walked the short trails in Fillongley Park – be sure to check out the old “homestead” created by the original owners of the land. 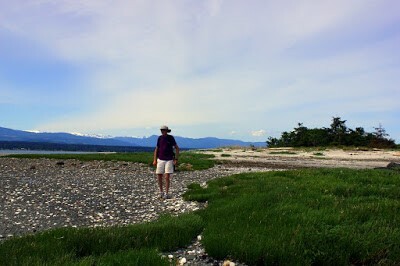 We then headed to Morning Beach Park (Morning Side Park according to the Denman Island Tourism Map) which is at the end of The Point Road at the north end of Denman Island. How many islands can you walk to at low tide? Allow about 40 minutes to walk the 3 km (1 way) to Tree Island. Obviously at the very low tides that we were experiencing we had quite a long window of time before the route would be flooded. In other situations you would have to monitor the tides much more closely in order to make it back to Denman Island before the route gets cut off by rising water. 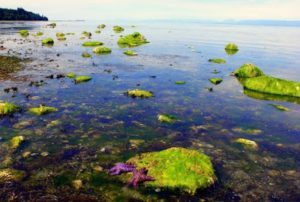 When we returned to Fillongley Park we headed down to the low tide mark and found colourful orche sea stars and casts of sand made by moon snails for their eggs. This was an extra bonus of the very low tides we happened to experienced on Denman Island during our visit. That evening we decided to launch our kayaks right from our campsite. In this case it was great to simply “wheel” our kayaks right from campsite along a short path to the beach. 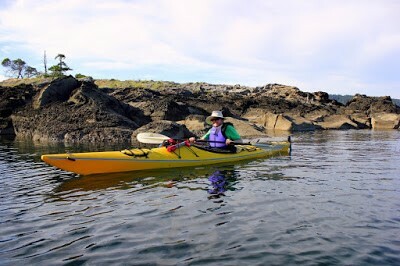 Like the previous night we did a relatively short paddle due to our late start (7:00 pm) and paddled north along a fairly non descript coast for 3.5 km or so before turning around. 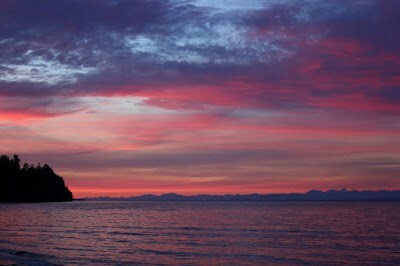 The evening sun was lighting up Hornby Island as we returned and that evening we were treated to a spectacular sunset from the beach at Fillongley Provincial Park. Denman Island makes a good hiking and sea kayaking destination and if you like pottery, handmade jewelry and art work then you could easily spend a couple more days here. Dozens of artisans call Denman Island home and many have home style galleries. You will definitely want to consider the tides before paddling since many launch points only seem to be easily accessible at medium high to high tides and a kayak cart won’t go astray. Re-posted with kind permission from Keith & Heather Nicol. Check out their BLOG for more kayaking stories. If you have Denman Island stories you’d like to share send them to the contact below.